We’re in the midst of a shakeup in the real estate industry. Technology is threatening to take agents out of the equation, making the profession obsolete. Or is it? The real estate industry is definitely in a state of flux; however, a true professional will never be replaced by the latest gadget, app or tech trend. How can you shore up your business to thrive in this new era? And, how can you sharpen your skills so you can exceed your clients’ changing needs? Use technology as a tool. Technology is not the enemy. In fact, technology is a useful tool to help you streamline your business and become a more efficient and effective agent. The key is to use it as a component to your business, not as the basis for your business. Focus on the fundamentals, which include consistent contact, filling needs and delivering the unexpected extras. These are the timeless tools that make up the foundation of a lasting business and can weather any changes in the market. The truth is the fundamentals remain relevant regardless of the latest trends. Understand your market. In addition to knowing your own sales numbers, learn all you can about your local market. What factors are having the biggest impact on your local economy and the market? Get involved in your local real estate organizations to stay up-to-date. The more you know, the better prepared you’ll be to answer your clients’ market-related questions. Invest in your relationships. According to Brian Tracy, “The value of a relationship is in direct proportion to the time that you invest in the relationship.” When you work by referral, your relationships drive your business. Regardless of what’s going on in the market and the latest industry trends, if you devote your time, effort and energy into each and every client in your database, you can be sure you’ll outlast your competition in the business. Sharpen your skills. The sharper your skills, the better equipped you’ll be to meet and exceed the needs and demands of your current and potential buyers and sellers. Regardless of how easy technology makes it to buy and sell a home, your clients still need you on their team throughout the process to help them negotiate with the other party, find the right home and guide them if challenges arise during the transaction. Let’s face it; technology is a poor substitute for true human advocacy. Follow these tips and you can be sure to future-proof your business. Want to learn more? 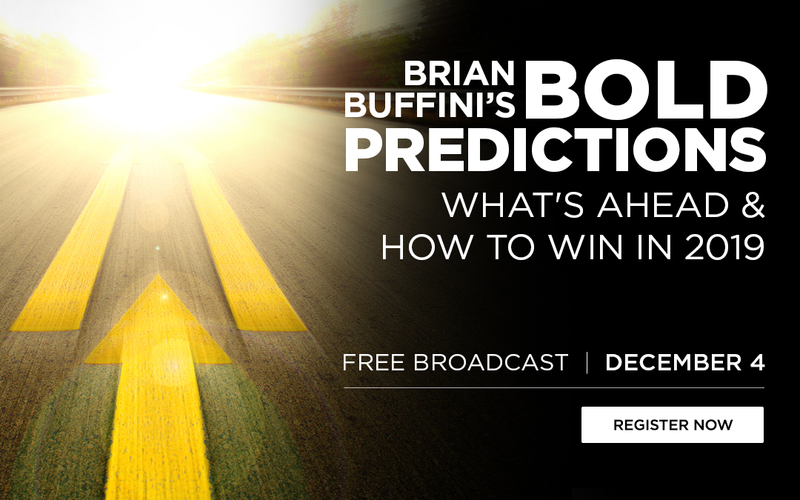 Tune in to “Brian Buffini’s Bold Predictions: What’s Ahead & How to Win in 2019,” on Tuesday, December 4 at 9:00 am PST. Industry expert Brian Buffini will share his market forecast and offer tips to help you meet the challenges and thrive. Brian Buffini immigrated to San Diego from Ireland in 1986 and became a top performing REALTOR®. He then founded Buffini & Company to share his powerful lead-generation system. Buffini & Company has trained over 3M people in 37 countries and coaches 25K+ business pros. Today, Brian’s a New York Times best-selling author and reaches over 1 million listeners a year through “The Brian Buffini Show” podcast. For more, visit buffiniandcompany.com. The post The 2019 Market: Prepare for Changes, Master the Fundamentals appeared first on RISMedia.